Recovered and restored: fascinating early-sound shorts from a bygone entertainment era. Venerable vaudevillians. Musical marvels. Crazy comics. Formidable character actors. Great performers and ensembles from the Warner Bros. vault comprise a dazzling 9+-Hour, 4-Disc Collection of 60 Theatrical Shorts (1926-1930). Twenty years ago, this set would not only not have existed, it would have been an unattainable dream. Because Vitaphone was a process where the sound was not on the film but on a large disc, in many cases either the film existed and sound was missing or vice versa. Then The Vitaphone Project came along, whose purpose was to unite as many discs and films as possible, and then to preserve them. The men who started it didn't expect much success; now these many years later, thousands of discs have been discovered in private collections and archives, with major finds happening every few months. These shorts are all recent restorations, and they are an invaluable record of Broadway and Vaudeville in the late twenties. UCLA and the Library of Congress have done a fantastic job saving these films. 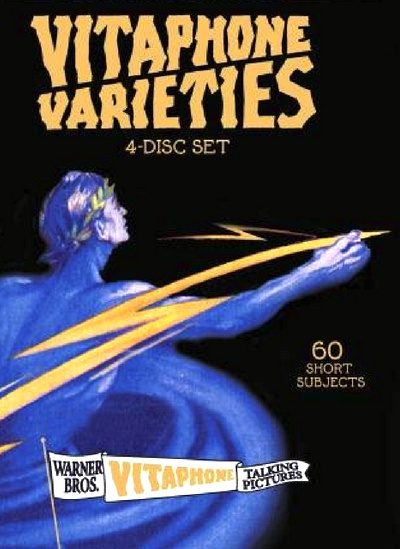 Vitaphone Varieties is an endlessly entertaining blast from the past. Colin and Glass in "Sharps and Flats"
Val and Ernie Stanton in "Cut Yourself a Piece of Cake"
Brown and Whitaker in "A Laugh Or Two"
Jimmy Clemons in "Dream Cafe"
Bert Swor in "A Colorful Sermon"
Gladys Brockwell in "Hollywood Bound"
Jay C. Flippen in "The Ham What Am"
Harry J. Conley in "The Book Worm"
Dora Maughan with Walter Fehl in "Song Impressions"
Henry B. Walthall in "Retribution"
Montague Love in "Character Studies"
Kjerulf's Mayfair Quintette in "A Musical Melange"
Val Harris with Ann Howe in "The Wild Westerner"
Eddie White in "I Thank You"
Marlowe and Jordan in "Songs and Impressions"
Val and Ernie Stanton in "English as She in Not Spoken"
Florence Brady in "A Cycle Of Songs"
Mitchell Lewis in "The Death Ship"
Al Lyons and His Four Horsemen in "My Musical Melange"
Robert Emmet Keane in "Gossip"
Born and Lawrence in "The Country Gentlemen"
The Rangers in "After the Round-Up"
Arthur Pat West in "Ship Ahoy!" Born and Lawrence in "Pigskin Troubles"
Frank Whitman "That Surprising Fiddler"
Ann Codee and Frank Orth in "A Bird in the Hand"
Bud Harris and Frank Radcliffe in "At the Party"
Fred Ardath in "These Dry Days"
Dooley and Sales in "Dooley's The Name"
Hobart Cavanaugh, Regina Wallace in "Sympathy"
Mel Klee in "The Prince of Wails"
Harry Fox and Bee Curtis in "The Bee and the Fox"
Coletta Ryan and Duke Yellman in "Songology"
Billy "Swede" Hall and Company in "Hilda"
John T. Murray and Vivien Oakland in "Satires"
Jans and Whalen in "Two Good Boys Gone Wrong"
Anderson and Graves in "Fishing Around"
Betty and Jerry Browne in "Let's Elope!" Joe Frisco in "The Songplugger"